This Expert Advisor trades news on any timeframe. The news are downloaded from the Forex Factory website. Make sure to add the URL to the terminal settings. The EA is launched on a single chart and defines all necessary pairs for trading on its own. 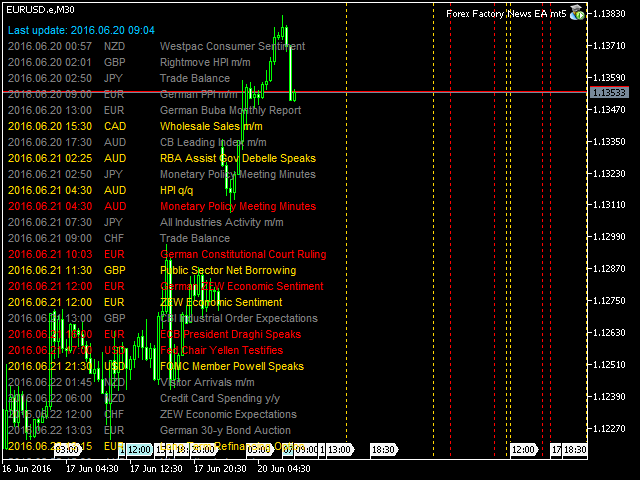 The robot works with pending orders setting two Buy stop and Sell stop orders before a news release. It determines the time zones of the calendar and terminal automatically. Make sure to add the time.is URL to the terminal settings. The EA can be tested in the strategy tester, but only on EURUSD. To do that, set the date of the past news in the strategy tester and specify the time of the news in the EA settings. Уже три года торгую с новостниками этого автора. И на МТ4, и на МТ5. Это самые безопасные и прибыльные советники на новостях из всех, которых я пробовала. Спасибо, жду новых версий, хотя и так все клево. Эта версия теперь ни мультивалютная, устанавливается на каждый график. Добавлена возможность выбора новостей для торговли.